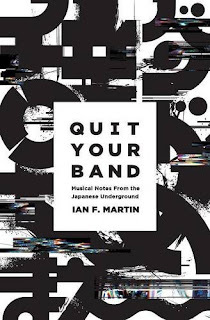 Writer and music blogger Ian Martin has published the first of two promised playlists going deep into the underbelly of Japanese rock and pop music. They are intended as accompaniments to his excellent book Quit Your Band! Musical Notes from the Japanese Underground - partly a summary of the Japanese music scene, and partly his own personal history as DJ, label manager, music reporter, gig organiser and more in Tokyo. Highly recommended for anyone wanting to know more about what lies beyond the Akihabara girl groups! Read more here and don't forget to buy the book!